Mexican Navy Sonora. Photograph copyrighted by Bofors Defence. Work on these weapons began in 1962 based largely upon experience gained with the Bofors 57 mm/60. Compared with that weapon, the major improvements of the Mark 1 were a higher rate of fire, the use of new munitions including an improved proximity fuse, water cooling for the gun tubes and a new electro-hydraulic system for rapid training and elevation. The Mark 1 was exported to Malaysia and (the former) Yugoslavia. The Mark 2 was a lighter weight mounting and used a new servo system that reduced aiming errors and damping time. 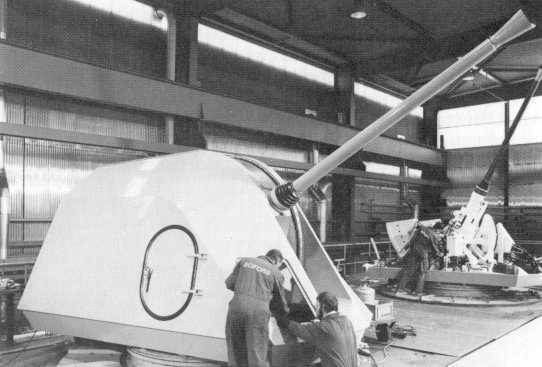 The gun barrel for this mounting used a special monobloc steel that eliminated the water jacket Bofors claimed that this gun was dual-purpose in that it was accurate and agile enough to destroy sea-skimmers and that it could put more explosives into a surface target in thirty seconds than any gun smaller than 10 cm (3.9"). In reviewing this weapon, the US Navy concluded that it was heavy when compared to the OTO-Melara 35 mm and 76 mm weapons. About 25 Mark 2 guns were manufactured. The Mark 3 is the latest version. This mounting uses the same ammunition as the Mark 2 but also can fire "smart" ammunition. 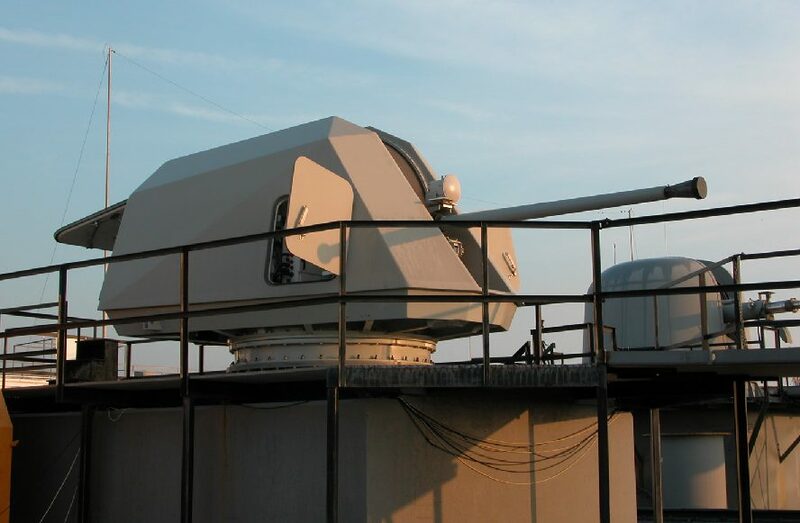 The Mark 3 is offered with an optional low radar profile (RCS) mounting which hides the gun barrel when not in use. It is claimed that the Mark 3 has a mean time to repair of 30 minutes and can be installed on ships as small as 150 tons (152 mt). This mounting uses a small radar mounted on the gun barrel to measure muzzle velocity for fire control purposes. The dual-hoist system allows instant switching between ammunition types, but rounds must be removed manually in case of misfire. This mounting can open fire at 45 degrees training and 35 degrees elevation from the stand-by condition in 2.2 seconds. 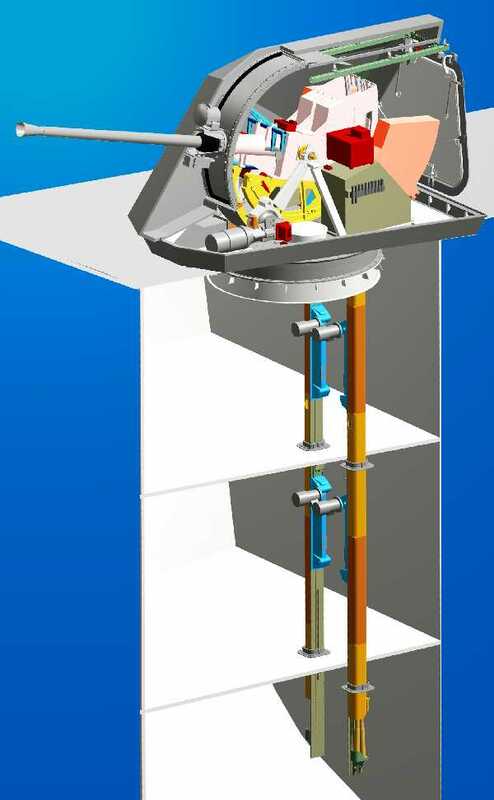 The mounting is normally remotely controlled, but can be used in a gyro-stabilized local control mode. Bofors was taken over by United Defense, which in turn has been taken over by BAE Systems. 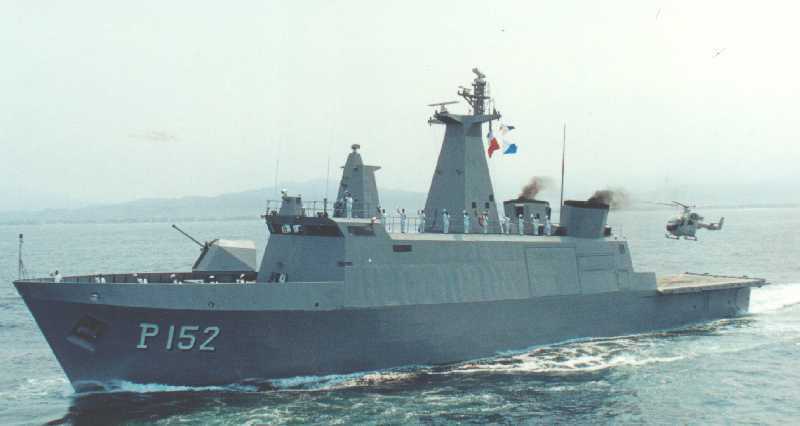 A 30 September 2003 United Defense press release stated that the United States Coast Guard had selected the Mark 3 to arm its new Maritime Security Cutter, Large (WMSL, formerly the National Security Cutter). At that time, the USN designated this weapon as the "EX-57 Mk 3" with the "EX" standing for "Experimental." The first WMSL was originally scheduled to enter service in 2006, but this has been delayed for various reasons to the spring of 2008. A 13 January 2004 United Defense press release stated that the USN designation for the Bofors Mark 3 had now been changed to "EX 110 Mod 0" at the request of the USN. This change of designation followed a successful firing test of 29 practice rounds and 26 rounds of 3P service ammunition at the Dahlgren Main Range in Dahlgren, Virginia. 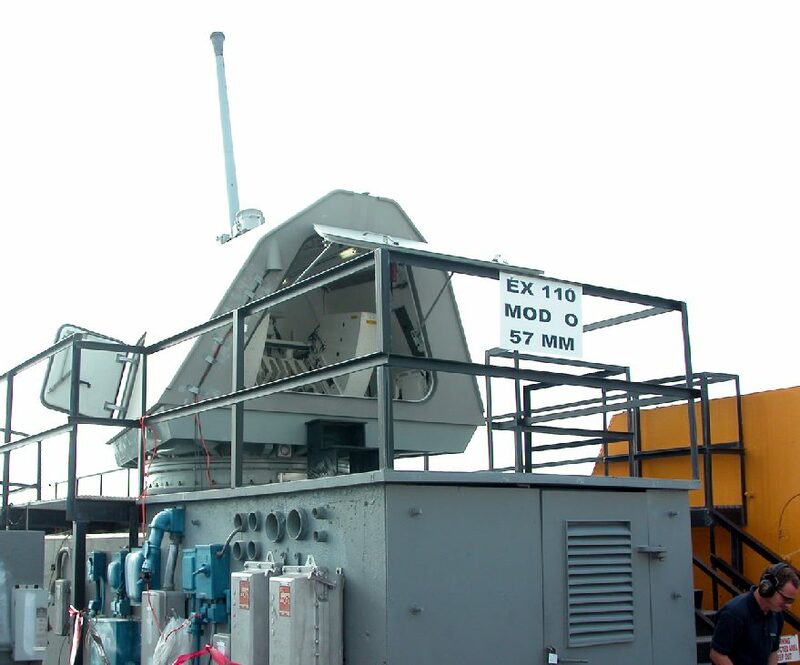 The initial test firings were conducted to verify the test range instrumentation and to document the gun system's characteristics for the upcoming Test Readiness Review of the EX 110 Mod 0 gun safety qualification project. 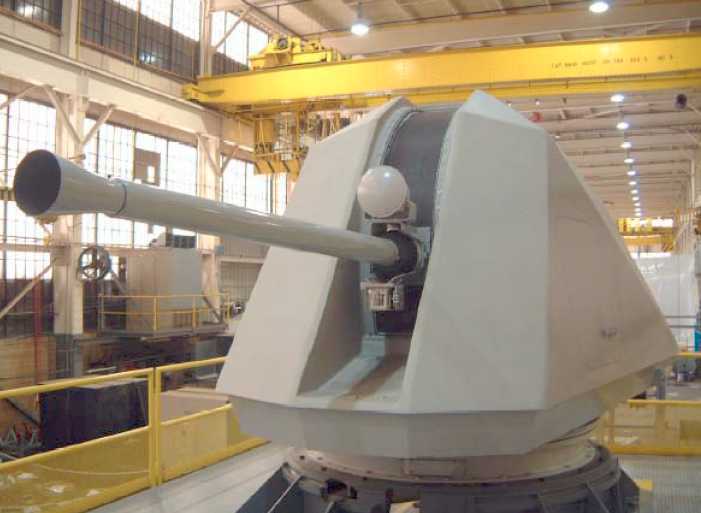 In September 2004, the Coast Guard announced that this weapon had been accepted into service and would now be designated as the Mk 110 Mod 0/57mm Gun. An article by Lt. Timothy Hacket (USCG) in the October 2004 issue of "Deepwater News" reported that: "Between November 2003 and September 2004, well over 2,000 rounds of 57 mm ammunition were successfully test fired. The test firings have been conducted in three phases to evaluate blast effects, ballistics, and serviceability . . . The serviceability testing included multiple 120-round firing evolutions at high firing rates to determine the guns sustainability. During one weeks course of firing, the test team successfully fired well over 620 rounds and collected a wealth of data . . . A nomenclature request has been submitted to establish the WMSLs GWS [Gun Weapon System] to include the Mk 110 Mod 0/57 mm Gun, Mk 46 Mod 1 Optical Sighting System, AN/SPQ-9B Radar, and the Mk 160 Gun Control System ballistic computer." 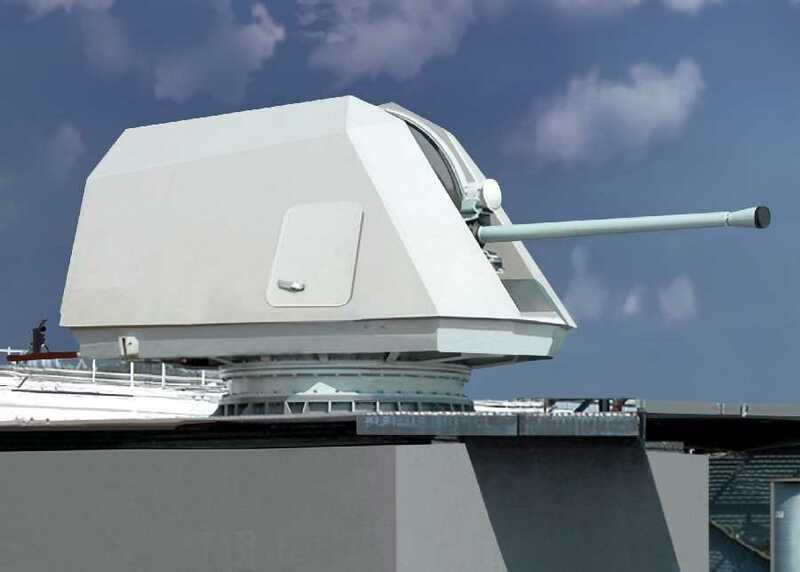 A 25 October 2004 United Defense press release stated that the USN had selected the Mark 110 "as the Close-In Gun System (CIGS) for the baseline design of the new DD(X) Destroyer program . . . 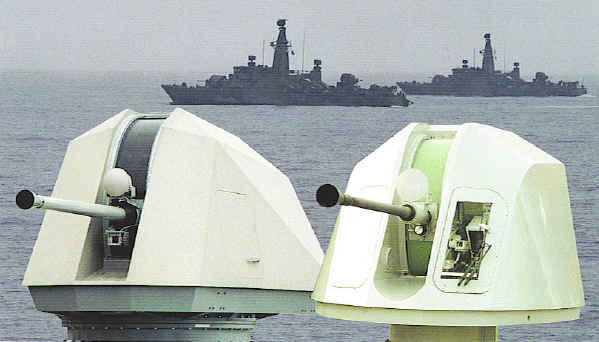 The function of the Mk 110 Naval Gun is to provide key ship self-protection and attack capabilities. The Mk 110 will work in concert with other combat systems being developed by United Defense, such as the ship's 155-mm Advanced Gun System (AGS) and the Mk 57 Vertical Launching System." 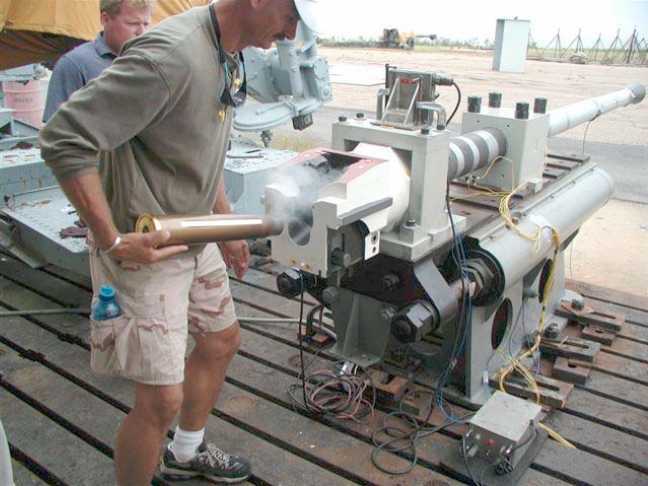 In a 01 November 2004 USCG Press Release concerning a day of Human Systems Integration (HSI) testing on the 57 mm Mark 110, participant GM3 [Gunner's Mate 3rd Class] Robert Boyer reported that "[the 57 mm Mark 110] is a huge upgrade from the 76 mm. As far as maintenance and accuracy of the new weapon, the all-around ability is a lot easier to handle compared to our current armament. I'll definitely look forward to working on the 57 mm gun." 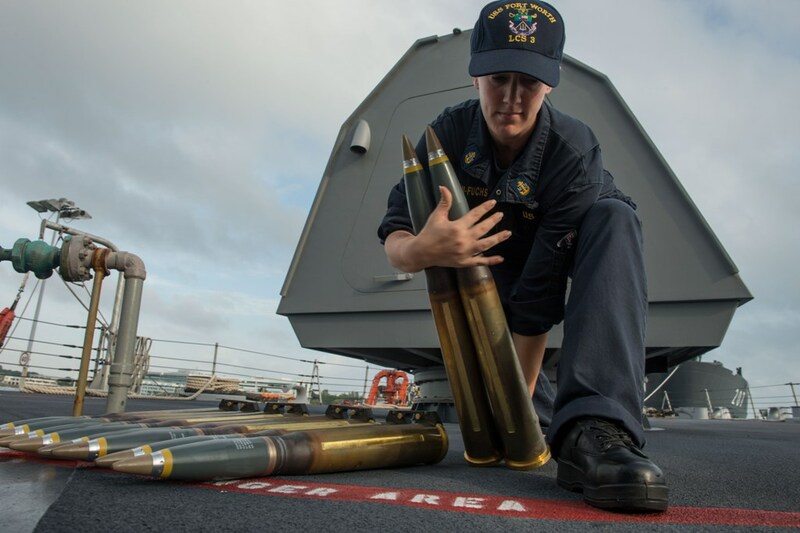 In this same release, Gunners mate PO3 [Petty Officer 3rd Class] Mike Sanders is quoted as saying that it "only takes up to three people for loading or unloading the 57 mm with more room to move compared to seven people loading or unloading the 76 mm." A 01 August 2005 BAE Press Release announced that the USCG has purchased two of these weapons, with delivery scheduled for January 2006 and December 2006. These guns will be manufactured at the BAE Systems facility in Louisville, Kentucky. 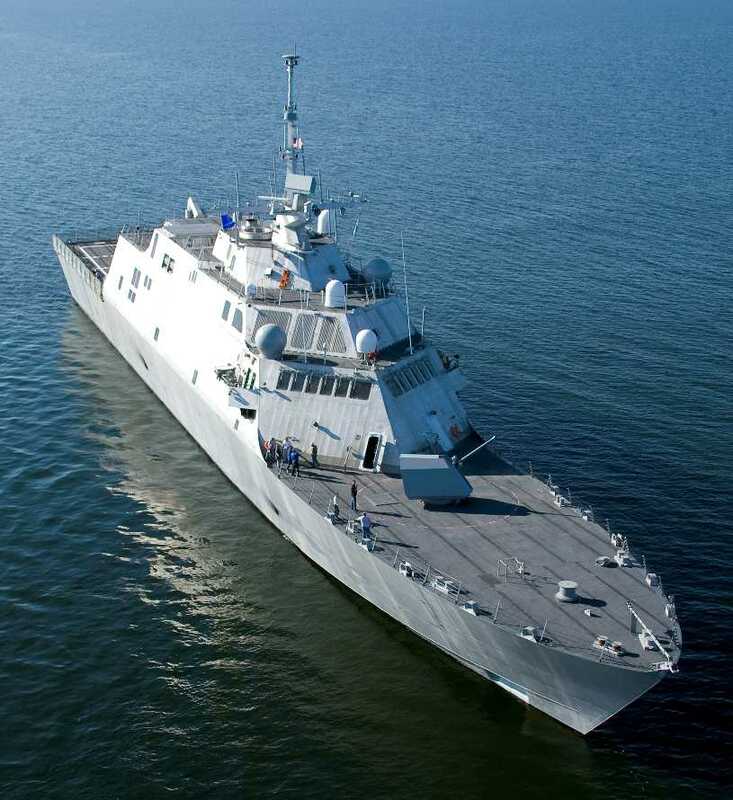 In April 2007 BAE Systems announced that it had received its second contract from General Dynamics for $7.2 million to supply a 57 mm Mark 110 for the U.S. Navy's fourth Littoral Combat Ship (LCS-4). The contract includes options such as spare parts and training. In August 2014 the USN announced that it had replaced the 57 mm guns on the DDG-1000 Zumwalt class with 30 mm Bushmaster weapons. Munitions are produced by Bofors, Sako Limited (Finland), SME Ordnance (Malaysia) and Nammo Raufoss (Norway). Typical dispersion of the Mark 3 for elevation (s-value) is 0.4 mrad while that for training (s-value) is 0.4 mrad. Most rounds have conical or hemispherical base outlines to improve aerodynamics and to maximize the internal volume. The original 57 mm rounds were of two types, HCER and SAP. The SAP round had a delayed action fuze which allowed the round to penetrate about 2 cm (0.8 inches) of armor and then explode after traveling a further 2 m (6 feet). When the ready-use magazines are emptied, the gun barrel is moved up to its maximum elevation. The cassettes are then traversed over to the loading position and their rounds are transferred into the ready-use magazines. Reloading takes approximately 30 seconds from the time that the last round is fired from the ready-use magazines until the time that the gun is ready to fire again. These guns used the same size cartridge case as did the 57 mm/60 guns, but the primer was changed to electrical firing. USN target practice rounds have been designated as Mark 296 Mod 0. A recent contract with BAE Systems priced these at $1,200US each, showing the high cost of even simple munitions. ^Bofors 57 mm 3P (Pre-fragmented, Programmable, Proximity-fuzed) all-target programmable ammunition allows 3 proximity fuzing options as well as settings for time, impact, and armor piercing functions. 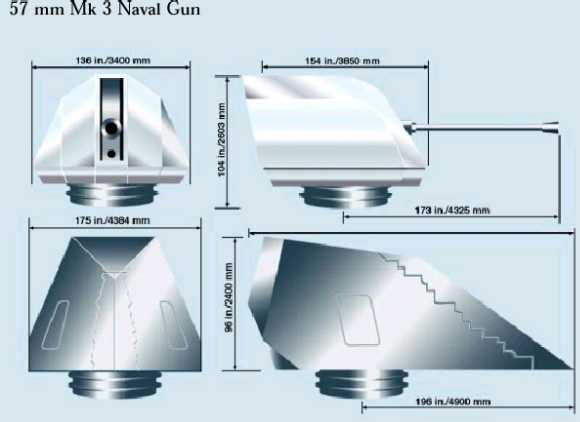 ^The USN has designated the 3P ammunition as Mark 295 Mod 0. ^The Mark 1 gun with a minor modification could use ordnance developed for the Mark 2 gun. ^4.14.2The Mark 2 and Mark 3 loader and gun mount are dual-sided so that two types of ammunition can be handled simultaneously. Ammunition comes up from the magazine via two hoists and goes into two 20-round cassettes mounted on a rail behind the gun. When filled, they move into position over the ready-use magazines and discharge their ammunition into them. There are also two intermediate 20-round cassettes. These mounting are powered by 440 Vac 60 Hz 3 phase. The length of the ammunition hoists can be adjusted to fit different applications from 77 to 386 inches (196 to 980.5 cm). DDG-1000 would have used a special low-RCS mounting similar in design to that for the 155 mm AGS. ^These mounting weights do not include ammunition. The Mark 3 mounting with 1,000 rounds ammunition has a total weight of 30,865 lbs. (14,000 kg). Swedish fast patrol boat Jagaren. 57 mm/70 Mark 1 with 2-inch (5.1 cm) flare rockets on sides. Picture copyrighted by Bofors Defence. Bofors 57 mm/70 Mark 2. Picture copyrighted by Bofors Defence. 57 mm/70 Bofors Mark 3. USN 57 mm/70 Mark 110. 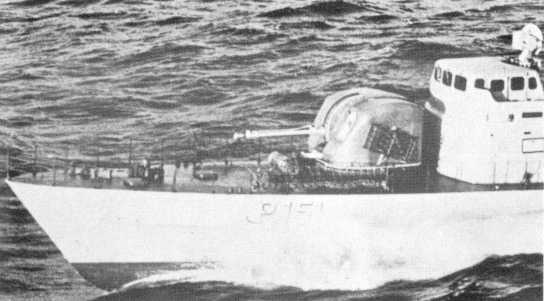 Note the small radar on top of the barrel. Image copyrighted by BAE Systems. 57 mm Mark 3 showing standard and low radar cross-section (LRCS) mountings. This LRCS mounting was not adopted, see below for LRCS for DD(X). Sketch copyrighted by United Defense. 57 mm/70 Bofors Mark 3 (EX 110) with all access hatches opened. Taken at Naval Surface Warfare Center Dahlgren (NSWCD) in November 2003. Note the 76 mm/62 Mark 75 at the right. USCG Photograph. 57 mm EX (for Experimental) Mark 110 mounting with gun barrel in the reload position. During reloading, the gun barrel is raised to its maximum elevation, which lowers the ready use magazines. The ammunition cassettes are then traversed over the tops of the ready-use magazines and empty their rounds into them. In this photograph, the right-hand ammunition cassette is the curved box inside of the housing. The tops of the ready-use magazines can be seen to the left of this cassette. Note the triangular shape of the openings in the ready-use magazines, which guide the noses of the projectiles as they drop into the ready-use magazines. Taken at Naval Surface Warfare Center Dahlgren (NSWCD) in November 2003. USCG Photograph. 57 mm/70 Mark 110 on Test Stand in Louisville, KY. USCG Photograph. 57 mm/70 Gun being test fired at Potomac River Test Range. USCG Photograph. 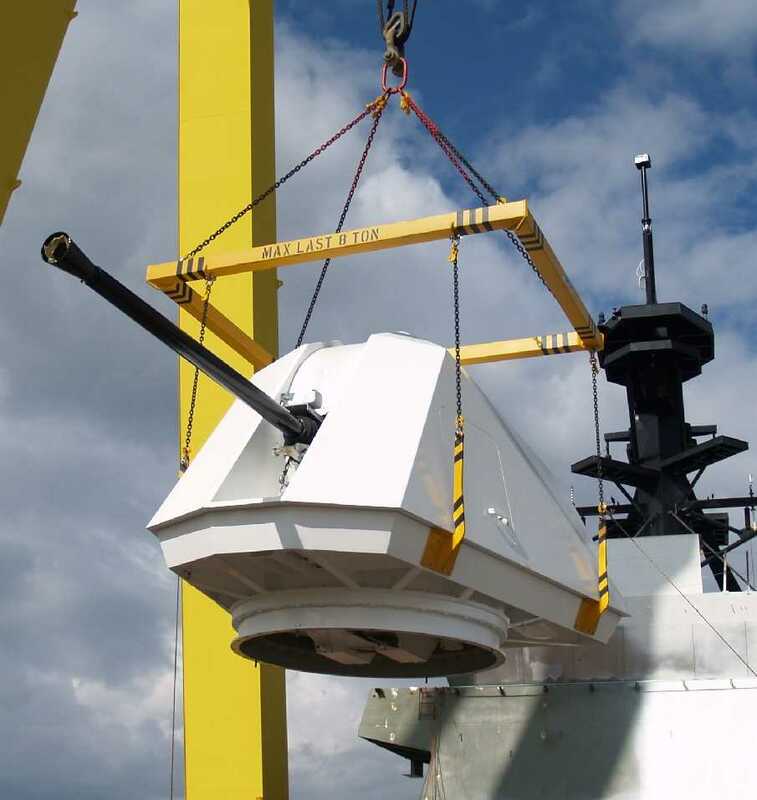 57 mm being installed onto USCG Bertholf (WMSL 750) at Northrop Grumman Ship Systems in Pascagoula, Mississippi. Image copyrighted by BAE Systems. 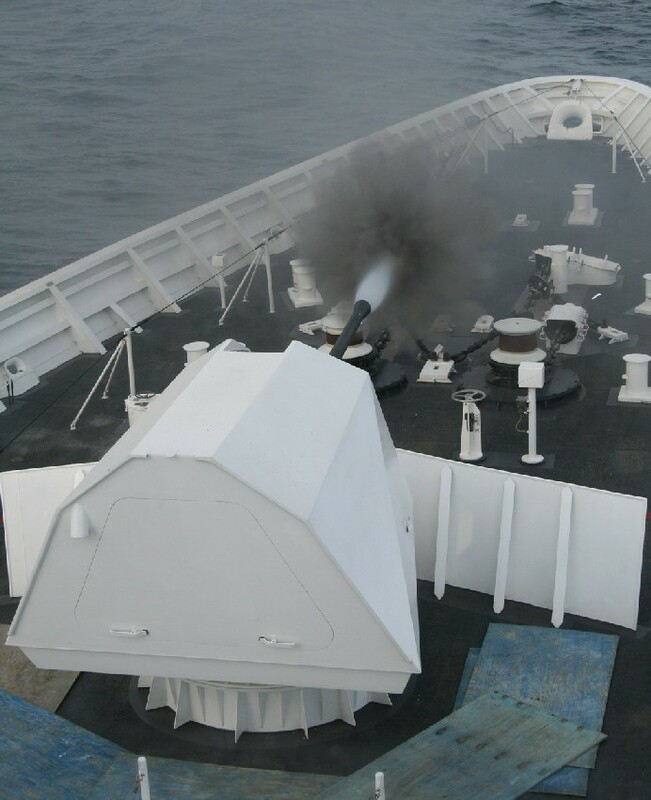 57 mm gun on USCG Bertholf (WMSL 750) being fired on 11 February 2008 during Builder's Trials. This was the first time that the 57 mm gun was fired off a USA ship, with a total of 30 rounds being expended. ICGS Photograph. USS Freedom LCS-1 preparing for trials on 28 July 2008. Lockheed-Martin Photograph released as US Navy Photograph No. 080728-O-XXXXX-008. 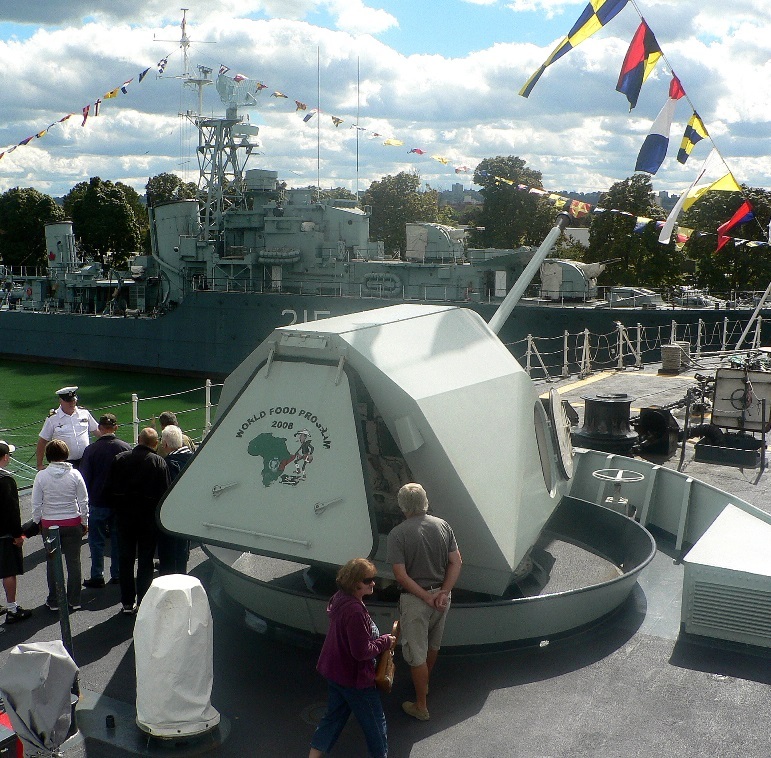 57 mm Mark 3 on HMCS Ville de Quebec. In the background is HMCS Haida. Photograph copyrighted by Mike Clark and used here by his kind permission. 57 mm/70 Bofors Mark 3 (EX 110). Cutaway view showing general arrangements, ammunition hoists and cassettes. USCG Photograph. Test round being loaded into the breech on USCG Bertholf (WMSL 750). Note the roomy gunhouse of this mounting and the twin ready use magazines directly above the breech. USCG Photograph titled "57mm". Comparison of Bofors 57 mm (left) and 40 mm guns. Picture copyrighted by Bofors Defence. 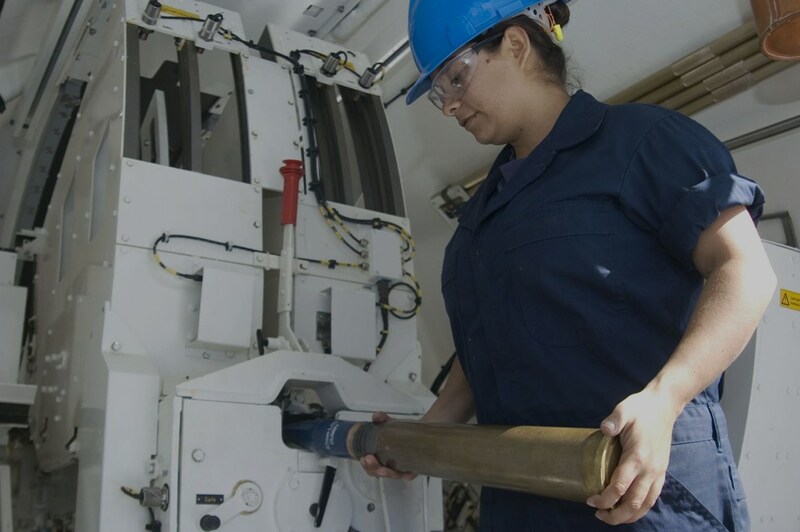 Chief Fire Controlman Beth Simpson-Fuchs moves 57 mm rounds aboard the littoral combat ship USS Fort Worth (LCS-3). Note the cartridge base clip used to hold pairs of rounds together, reminiscent of the 4-round clips used for the 40 mm/56 Bofors ammunition. US Navy photograph No. 150205-N-DC018-112.